‘Break into song’, with this theme we the relatives, students, staff members and sisters of the neighbouring communites gathered around our dear Sr. Theresa Baretto on the occasion of her diamond jubilee of Religious Profession at Auxilium Benaulim on 28th July 2018. 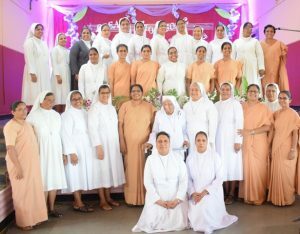 She was solemnly escorted by Sr. Ritha Dora our Provincial and Sr. Wilma De Souza and brought by jeep surrounded by a group of young dancers. This was followed by the Eucharistic celebration with Fr. Edison Fernandes as the main celebrant. In his homily, he spelled out the entire life of our dear jubilarian summing it up in a single word ‘Thanks’. This was followed by a short cultural programme by the students of Auxilium Benaulim. The Parish Priest of Velim who was also present for the occasion thanked her for her exemplary life. We then joyfully participated in a fellowship meal.